1. Under this scheme, 2500 Scholarships will be awarded to eligible students with disabilities for degree and post graduate level professional and technical courses from recognized institutions in India. 2. 30% scholarships will be reserved for girls, which will be transferable to male students in case of non-availability of female candidates. 3. Applicants may apply at any time in academic year for scholarship under this scheme. Scholarships will be awarded quarterly basis for the applications received in preceding quarter Under this scheme, an advance copy of application should also be submitted online (www.nhfdc.nic.in) by the candidate. 4. Reimbursement of Non-Refundable fees restricted to the limit of fee of similar courses in Government/ Government -aided institutions. Maintenance allowance will be paid to the students for 10 months @ Rs. 2500/ per month for Professional Graduate Courses and Rs.3000/- per month for Professional Post-Graduate Courses in one academic year. 5. Books/Stationery allowance will be paid to students pursuing Professional Graduate Courses @ Rs.6,000/ per annum and Rs.10,000/- per annum for pursuing Professional Post-Graduate Courses. Differently-abled students in addition will be provided financial assistance for purchase of aids & appliances (only once during life time). 6. Monthly income of the beneficiary /parent or guardian should not be more than Rs.25,000/- (Rs. 3.00 Lakh p.a.) from all sources. Family income includes income of parent/guardian. Objective: The objective of the Scheme is to provide financial assistance to the differently-abled students to enable them to pursue professional or technical courses from recognized institutes and get employed/self-employed. Number of Scholarships: To start with every year 2500 scholarships will be provided to the differently-abled students throughout the country. 30% scholarships will be reserved for girls, which will be transferable to male students in case of non-availability of female candidates. 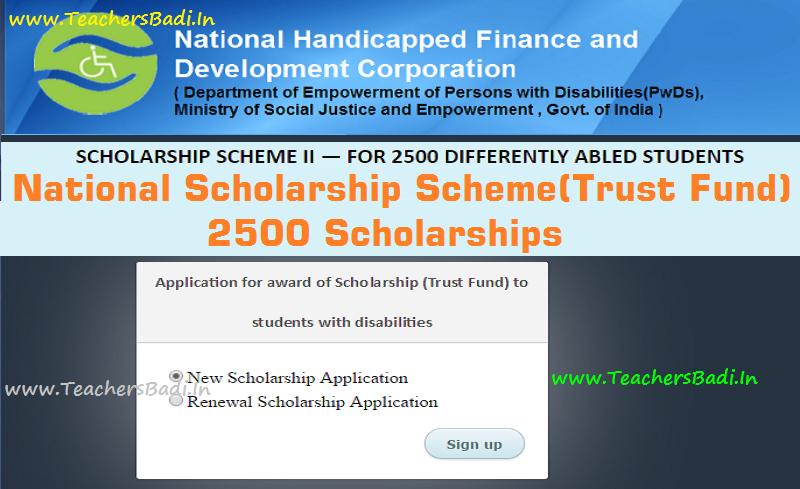 Scope: These scholarships will be available for studies in India, for all differently-abled students who are covered under the Persons with Disabilities (Equal Opportunity, Protection of Rights and Full Participation) Act, 1995 and the National Trust for the Welfare of Persons with Autism, Cerebral Palsy, Mental Retardation and Multiple Disabilities Act, 1999. Only Indian Nationals will be eligible for scholarships. Application in enclosed prescribed format shall be submitted at any time during an academic year to the assigned agency. An advance copy of the application should also be submitted on line. Each applicant shall be given a registration number on receipt of the application. The screening committee shall examine these applications quarterly and the scholarship amount will be disbursed. So, The applicant has to apply online (www.nhfdc.nic.in) and printed copy the online filled application duly countersigned and recommended by the Head of the Institution, where they are studying along with requisite documents send to: National Handicapped Finance and Development Corporation (NHFDC), Red Cross Bhawan, Sector-12, Faridabad-121007. It is to be noted that without a hard copy of application, a candidate's application in soft copy will not be entertained. 3. Income certificate is to be submitted by the student only once i.e. at the time of sanction of scholarship. (i) Academic record – attested copies of relevant certificates/mark sheets for the qualifying examination. (iv) Course fee receipt if any, duly paid during the academic session & verified by institution. (v) Enclose Receipt/invoice of eligible assistive devices purchased from authorized dealer having VAT/TIN/CST No. (vi) Attested copy of all enclosure must be attested by Gazetted Officer /head of Institute/College. (i) Disability certificate should be in pdf,doc format having file size not more than 100 kb. (ii) Current Year Paid Fee Receipt should be in pdf,doc format having file size not more than 100 kb. (iii) Candidate Photo should be in jpg,bmp,png format having file size not more than 50 kb. (iv) Cancel cheque Or Copy of pass book should be in pdf,doc format having file size not more than 100 kb..
(v) In case of Renewal Form.